101 — ინგლისური ელექტრონული ჯგუფ Depeche Mode-ის პირველი საკონცერტო ალბომი, ჩაწერილი პასადენაში, 1988 წელს. იგი გამოვიდა ბრიტანეთში 1989 წლის 11 მარტს. გარდა ალბომისა ასევე გამოიცა ფილმი ჯგუფის კონცერტით. ამ დისკზე მოცემულია მხოლოდ კონცერტი, დოკუმენტური კადრების გარეშე. * ნიშნით აღნიშნული სიმღერები DVD-ზე პირველად არის შეტანილი და არ შედიოდა ორიგინალურ ვიდეოკასეტაზე. სიმღერების Sacred, Something to Do, The Things You Said, Shake the Disease, Nothing, People are People, A Question of Time და A Question of Lust კადრები არქივებიდან დაკარგული იყო და მათი შეტანა DVD-ზე შეუძლებელი გახდა. ↑ "Review: 101". Rolling Stone. 1989. დაარქივებულია ორიგინალიდან 2010-01-16-ში. http://www.webcitation.org/5mpuS4Nzt. ↑ Caramanica, Jon (3 ნოემბერი 2003). "Review: 101". Rolling Stone. http://www.rollingstone.com/music/albumreviews/101-20031110. ↑ Response from ARIA re: chart inquiry, received 17 თებერვალი 2016. Imgur. წაკითხვის თარიღი: 17 თებერვალი 2016. ↑ Depeche Mode – 101 – Live გერმანულად. Austriancharts.at. წაკითხვის თარიღი: 3 მარტი 2013. ↑ "100 Albums". RPM 50 (3). 15 მაისი 1989. ISSN 0033-7064. http://www.collectionscanada.gc.ca/rpm/028020-119.01-e.php?&file_num=nlc008388.1040&type=1&interval=50&PHPSESSID=m89iq841abagb37ld9c0fdc1f3. წაკითხვის თარიღი: 3 მარტი 2013. ↑ Dutchcharts.nl – Depeche Mode – 101 – Live ჰოლანდიურად. GfK Dutch Charts. Hung Medien. წაკითხვის თარიღი: 3 მარტი 2013. 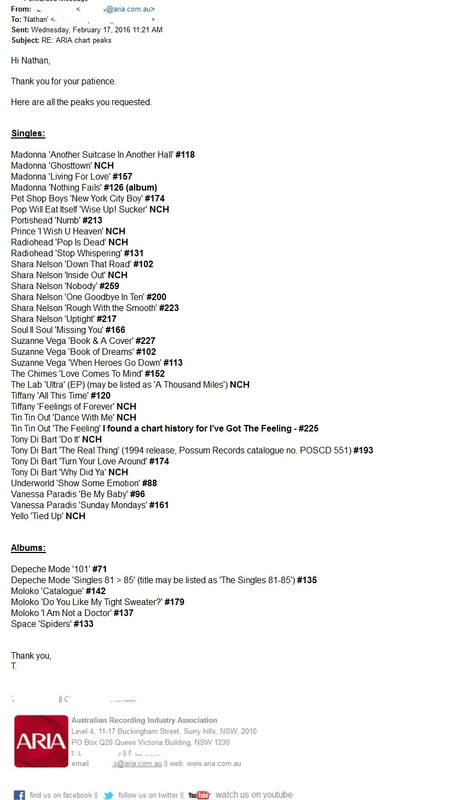 ↑ InfoDisc: Tous les "Chart Runs" des Albums Classés Depuis 1985 Dans le Top Albums Officiel French. InfoDisc. დაარქივებულია ორიგინალიდან - 18 თებერვალი 2010. წაკითხვის თარიღი: 3 მარტი 2013. Under the drop-down menu, search for DEPECHE MODE and click OK.
↑ Top 100 Longplay გერმანულად. Charts.de. წაკითხვის თარიღი: 3 მარტი 2013. ↑ Swedishcharts.com – Depeche Mode – 101 – Live. Swedishcharts.com. წაკითხვის თარიღი: 3 მარტი 2013. ↑ Depeche Mode – 101 – Live გერმანულად. Hitparade.ch. წაკითხვის თარიღი: 3 მარტი 2013. ↑ 1989-03-25 Top 40 Official UK Albums Archive | Official Charts. ოფიციალური ჩარტების კომპანია. წაკითხვის თარიღი: 3 მარტი 2013. ↑ 101 – Depeche Mode: Awards. AllMusic. წაკითხვის თარიღი: 3 მარტი 2013. ↑ Canadian album certifications – Depeche Mode – 101. Music Canada. წაკითხვის თარიღი: 3 მარტი 2013. ↑ French album certifications – Depeche Mode – 101 ფრანგულად. ეროვნული ხმისჩამწერი სინდიკატი. ↑ Les Albums Double Or : French. Infodisc.fr. დაარქივებულია ორიგინალიდან - 20 დეკემბერი 2013. წაკითხვის თარიღი: 8 აპრილი 2013. ↑ ოქროს/პლატინის მონაცემთა ბაზა (Depeche Mode; '101') გერმანულად. ფედერალური მუსიკალური ინდუსტრიის ასოციაცია. ↑ French video certifications – Depeche Mode – 101 ფრანგულად. ეროვნული ხმისჩამწერი სინდიკატი. წაკითხვის თარიღი: 3 მარტი 2013. ↑ ოქროს/პლატინის მონაცემთა ბაზა (Depeche Mode; '101') გერმანულად. ფედერალური მუსიკალური ინდუსტრიის ასოციაცია. წაკითხვის თარიღი: 3 მარტი 2013. ↑ Polish video certifications – Depeche Mode – 101 პოლონურად. პოლონეთის აუდიოს და ვიდეოს მწარმოებლები (ZPAV). წაკითხვის თარიღი: 3 მარტი 2013.